Through our research on citizen-generated data initiatives across the world, we’ve come across a lot of initiatives on various themes. Last year, we began to gather up a list of such initiatives, and to get the most out of that information, we worked with network-movement ecologist Ari Sahagún to understand and visualise the data. Today, we’re very happy to put this set of network visualisations online for anyone to explore. Visualising connections instead of looking at a database or table format reveals different qualities in the dataset. For example, we can quickly see which Sustainable Development Goals (SDGs) are well represented and which aren’t, and also where there may be gaps in datasets. By adding some additional geographic metadata, we can dig a little deeper to see where certain SDGs are being more prominently addressed. 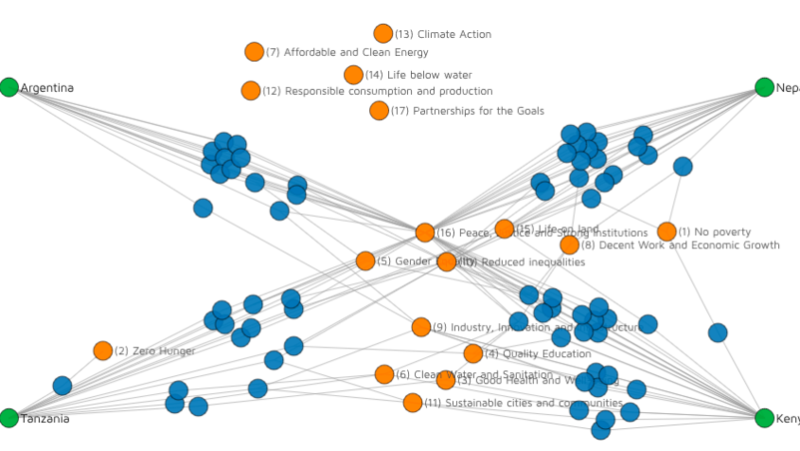 Do particular SDGs lend themselves to being tracked or monitored with citizen-generated data? From the data that we have: are initiatives in particular geographic areas working on certain themes, more than others? What are common themes in the DataShift geographic focus areas (Nepal, Argentina and Tanzania/Kenya)? Citizen-generated data initiatives and the Sustainable Development Goals: showing which SDGs have the most initiatives addressing that particular goal. Citizen-generated data initiatives around the world: showing where those SDG-focused initiatives are operating. Citizen-generated data initiatives in the DataShift’s focus areas: showing what initiatives are in these four countries and what SDGs their work relates to. Each of these visualisations are interactive and explorable online, and have accompanying commentary with tips on what to look for and how to use them. We also include a methodology section to highlight that this data isn’t intended to be comprehensive: it’s simply the initiatives that we’ve come across during our DataShift research. We want this visualisation to grow in the future, too. If you’re working on a citizen-generated data initiative that you don’t see represented here, you can submit it to the database and after moderation, it will be added to the visualisation. If you’ve got feedback or questions, please get in touch with datashift@civicus.org.